Dr. Valentina B. Iepuri is Assistant Professor of Russian and Director of the Russian Language Program in the Department of Modern Languages at The University of Mississippi, where she has been teaching since 2001. She received her M.A. 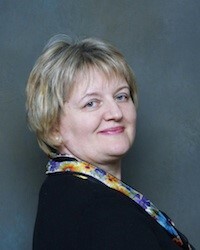 degree in TEFL/Translation from the State University of Moldova (1980) and her Ph.D. in Linguistics from the Minsk State Linguistic University (1989). Dr. Iepuri coordinates and teaches Russian language courses from beginner to advanced levels and advises students on their study abroad programs. Her current research interests include Russian language in the post-Soviet period, languages in contact, and language pedagogy. Dr. Iepuri is the holder of Excellence in Teaching Russian Award from the Central Association of Russian Teachers of America, Outstanding Leadership Award from Mississippi Foreign Language Association, Fulbright and Swedish Institute Fellowships, American Council of Teachers of Russian and The University of Mississippi Faculty Research grants.